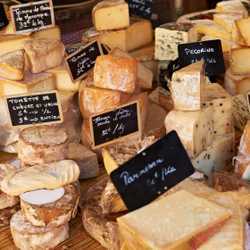 French dairy products include more than an awesome array of cheeses. The Hexagon specializes in all sorts of milk products including cream, butter, yogurt, crème fraîche, and a vast number of dairy based desserts. Just plain old milk is one dairy product that gets surprisingly little love in France. 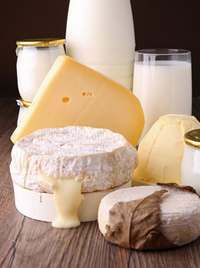 There is a distinct tendency to make milk into something else, like cheese or yogurt. In general the milk available at the grocery store in France has been sterilized by heating it very rapidly to a very high temperature. This milk is marked UHT (ultra-haute température) and comes in opaque bottles that can be stored at room temperature for months. An advantage with this sort of packaging is that you never have to run out at the last minute for a bottle of milk. The taste is a little different from pasteurized or raw milk, but unlike many French people, my kids guzzle it by the gallon. Normally you can find it in whole (entière), low fat (demi-ecrémé) and non-fat (ecrémé) versions. Just like milk, this French dairy product is often heat sterilized and can be stored for months on a cool pantry shelf. Many people keep a bottle on hand for adding to recipes. Just a couple of tablespoons in soups, sauces, and desserts, can make a real difference in flavor. Generally speaking there are two sorts of cream in France, a full fat (usually about 30 percent) version, which is marked crème liquide, and a lower fat version, crème légère, which you may call half and half or single cream (depending on where you live). If you are trying to make whipped cream (crème chantilly), be sure to use the full fat version. If you are in France, you might like to try some AOC (appellation d'origine contrôlée) crème d'Isigny. This is produced and conditioned in Normandy and is reputed to be the some of the best cream you will ever taste. This also makes frequent appearances in French recipes. It is made from fermented cream, so its name (fresh cream) is a bit of a mystery to me. Typically crème fraîche comes in little tubs and is firm, but it is also sold in liquid form, ideal for incorporating into recipes. You might liken it to sour cream, but it is distinctly different in taste and consistency. It has a velvety texture and a nutty and just ever so slightly acidic taste, and it does not separate when heated. Depending on where you are in the world, you may be able to buy this French dairy product as it is becoming more and more popular outside of France. However, if you can't find it or it is just too expensive (paying more than a couple of Euros for a small tub would be silly), you can make your own. It is very easy -- you just need milk, vinegar and a bit of time. Try my crème fraîche recipe here. You do know that France is positively swimming in an incredible variety of fabulous cheese, don't you? Some say more than 500 different kinds, but one can imagine that it is even more than that! In general, it is surely best that you eat cheese that is made near where you live, with maybe an occasional treat from France. However, it can be helpful to learn about French cheese anyway as it does set the standard for what many cheese makers around the world are aiming for. Also, if you are planning a trip to France, you should by all means learn a little about the cheese and taste as much as you can when you are here. It is worth the trip! Learn more about French cheese. Don't be fooled by the name, this French dairy product isn't much like cheese at all. It is more similar to yogurt, with perhaps slightly less tang. It comes in full fat, low fat and non-fat versions. The French might eat this topped with a little sugar or fruit for breakfast or dessert. It can also be used in recipes, like this French cheesecake recipe. If you come to France, be sure to try some yogurt. Everyone who visits us here exclaims over the quality. Somehow the French just get it right - a wonderful balance of acidity to creaminess. Nature - This indicates that there is no added sugar. Brassé - A yogurt that is more liquid than others. A la Grecque - A thick and rich yogurt that can even be used as a substitute for crème fraîche. Right next to the yogurts in a French grocery store, you will find an enormous selection of milk based desserts. These include crème brûlés, crème caramels, riz au lait, oeufs au lait, îles flottantes and mousses. Despite their attractive appearance, I don't think any of them are very good. You will be far better off making your own, but if you feel tempted to try one, have a good look at the label. Remember you are looking for milk and a little sugar. Oh my, how I love French butter. Butter got a bum rap for many years in fat obsessed western culture, but it is poised to make a comeback, and I am doing my best to help out here in France. Beurre doux - This has no added salt. You can use it for cooking, baking, and even topping vegetables (along with a little coarse sea salt). Usually when a French recipe calls for butter, it means beurre doux, as salted butter is considered the exception. For many French people, this is the only butter they use. Beurre salé - Salted butter. We use this for spreading on bread, crepes, and just about anything. It seems to be considerably more salty than the regular butter available in other parts of the world. If a French recipe is made with salted butter, it will specifically say so. Just as with cream, the region of Normandy has cornered the market on exceptional butter with their AOC beurre d'Isigny. Because it ships fairly well, butter is one French dairy product you might consider ordering for delivery. Might I suggest you try it once and then use it as a standard for purchasing butter that is made near where you live? Return from French dairy products to French Foods.